Save up to 6% in Hudson Valley broker commission by listing For Sale by Owner in Westchester, Bronx, Orange, Putnam, Queens, Dutchess, Ulster, Rockland or Sullivan Counties with a Hudson Gateway Flat Fee MLS Listing Package. Seller closing costs are high enough, so why add another 6% to your bill by hiring a full-service listing agent when you can sell on your own? Hauseit’s HGMLS Flat Fee MLS Listing Service lists your home on the Hudson Gateway Association of Realtors MLS database (HGMLS), Zillow, Realtor.com, Trulia and dozens more websites for 0% seller’s broker commission. Our Hudson Valley focused Flat Fee MLS (HGMLS) listing service uses the same listing syndication technology as traditional, full-service agents who charge 6% in commission. Your FSBO listing will receive the same marketing exposure and access to both unrepresented and represented buyers as if you had hired and paid 6% to a traditional listing agent. Selling FSBO in the Bronx or Manhattan? If you are selling a home in the Bronx or Manhattan, Hauseit offers you the ability to list on both the Hudson Gateway MLS as well as REBNY’s RLS Broker Database at the same time. * This unique dual coverage model ensures that your listing will be accessible to buyer’s agents who are members of either the Hudson Gateway Association of Realtors or the Real Estate Board of New York, which is the largest real estate trade group in the greater NYC area. As of this writing, there is much overlap in the Bronx between REBNY and HGAR, with REBNY Member Firms increasing the amount of territory they cover outward from Manhattan in gentrifying areas like Riverdale and even Mott Haven. The Hudson Gateway Association of Realtors merged in 2016 with the Manhattan Association of Realtors who had operated the struggling Manhattan MLS. Even though the REBNY RLS is without a doubt the primary broker database in Manhattan and most of New York City, it may be helpful to have additional exposure by having your NYC home also listed on the HGMLS. Why Sell For Sale by Owner in Hudson Valley? Save thousands in commission by listing with a full-service, HGAR member listing agent in Hudson Valley for just 1% commission. Why should you have to pay 6% just because you don’t have the time or motivation to sell For Sale by Owner? Seller closing costs in New York are high enough, so why give away another 6% of your sale proceeds by hiring a full-service listing agent? Real Estate commissions in New York’s Hudson Valley continue to be sky high despite the advancement of technology and the greater transparency and buyer empowerment it facilitates. As a seller, it’s never been easier to leverage technology in order to market your home with the same effectiveness as a traditional agent but for a fraction of the price. Your typical full-service brokerage in Hudson Valley will offer you countless excuses for why they are justified in charging you the full 6% commission. They will claim that their marketing is top notch and that they have a list of buyers already lined up to purchase your property. What these full-commission brokerages fail to mention is that you can achieve the same marketing exposure by using Hauseit’s Hudson Gateway Flat Fee MLS listing package. Our Hudson Valley Flat-Fee MLS listing service uses the same listing syndication technology as traditional, full-service agents, which means that your listing receives the same marketing exposure as if you had hired and paid 6% to a traditional listing agent. Your listing will be comprehensively marketed on HGMLS (Hudson Gateway Multiple Listing Service) as well as dozens of real estate websites, ensuring that you have full exposure to both represented and unrepresented buyers. Seller closing costs in New York are high enough, so why give away another 6% of your sale proceeds by hiring a full-service listing agent? Real Estate commissions in Hudson Valley continue to be sky high despite the advancement of technology and the greater transparency and buyer empowerment it facilitates. As a seller, it’s never been easier to leverage technology in order to market your home with the same effectiveness as a traditional agent but for a fraction of the price. As a FSBO seller in Westchester, Bronx, Orange, Putnam, Queens, Dutchess, Ulster, Rockland or Sullivan Counties, there is no greater priority than ensuring that your listing is correctly marketed to both unrepresented and represented buyers. Many unsuspecting FSBO sellers fail because they purchase a generic national ‘Flat Fee MLS’ package which is not designed specifically for Hudson Valley. Hauseit’s Hudson Gateway Flat Fee MLS package is specifically designed for FSBO sellers in Hudson Valley. We list your home on the official MLS of the Hudson Gateway Association of Realtors (HGAR), which is called HG MLS. This shared database of listings is used by thousands of fellow HGAR Realtors and real estate offices in Hudson Valley. Being listed on HGMLS is the single most effective marketing method for exposing your listing to the buyer’s agents who represent over 75% of buyers. Your home will also be listed on popular consumer websites such as Zillow, Realtor.com, Trulia, Homes.com and dozens more leading real estate websites. Because we use the same listing syndication technology as full-service brokers, our Hudson Gateway Flat Fee MLS package offers your listing the exact same exposure as if you’d hired a full-service Hudson Valley listing agent and paid 6% in commission. Over 75% of buyers are represented by buyer’s agents in Hudson Valley. If you fail to effectively co-broke with buyer’s brokers, it means that you are marketing your listing to just 25% of potential buyers. Restricting the number of buyers who are looking at your listing will result in less traffic, fewer offers and ultimately a lower sale price if you happen to sell at all. When there are thousands of broker-listed properties with documented commissions posted in HG MLS (Hudson Gateway MLS), why would a buyer’s agent send his or her buyer to a FSBO listing and risk being paid less commission or none at all? Our Hudson Gateway Flat Fee MLS package solves this fundamental trust issue by advertising your listing in HG MLS for all HGAR member agents to see. Thousands of HGAR Members use HG MLS to search for and directly send listings to buyers. By being listed on the Hudson Gateway MLS, your listing will therefore receive unparalleled exposure to virtually every single agent in Hudson Valley. Hauseit’s Hudson Gateway Flat Fee MLS listing service allows you to effectively market to the 75% of buyers who are represented by buyer’s agents in Hudson Valley. Buyers’ Realtors have to do a lot more work in the Hudson Valley compared to NYC. For starters, there is the cost of time and transportation as properties are located further apart and they will need to drive. Furthermore, many buyers expect their buyer’s Realtor to drive them around like a chauffeur. As a result, it is very common for buyers’ Realtors to demand a signed Exclusive Right to Represent agreement before agreeing to start working with a buyer. Without such an agreement, a buyer can walk away at any time and even work with another buyer’s broker! As a result, not only are most buyers in the Hudson Valley represented by Realtors, but most buyers also have an exclusive agency agreement in place with their buyer’s Realtor. Therefore, it’s more important than ever to make sure you are properly engaging buyers’ agents by listing your home in the HGMLS! Just remember, the commission you offer to buyers’ brokers in HGMLS is not so onerous when you consider the amount of work they do, and the statistic* that Realtors on average make only 1-4 sales annually, 30% of Realtors make no sales every year and that 20% of Realtors make most of the sales. What is a Hudson Gateway Flat Fee MLS Listing? Why should I list my property on the Hudson Gateway MLS (HGMLS)? What is the Hudson Gateway Association of Realtors (HGAR)? What areas of Hudson Valley do you service? A Hudson Gateway Flat Fee MLS Listing enables home sellers to receive the same marketing exposure to all home buyers as they would receive from a traditional listing agent who charges 6% commission. Per the HGMLS Rules and Regulations, the HGMLS covers Westchester, Bronx, Orange, Putnam, Queens, Dutchess, Ulster, Rockland and Sullivan Counties. Therefore, you’ve come to the right place if your home is in one of the above Hudson Valley counties. Because roughly 75% of buyers nationwide are represented by buyers’ agents, it’s essential for you to advertise your home to agents in a friendly manner if you are looking to maximize the number of offers you receive. 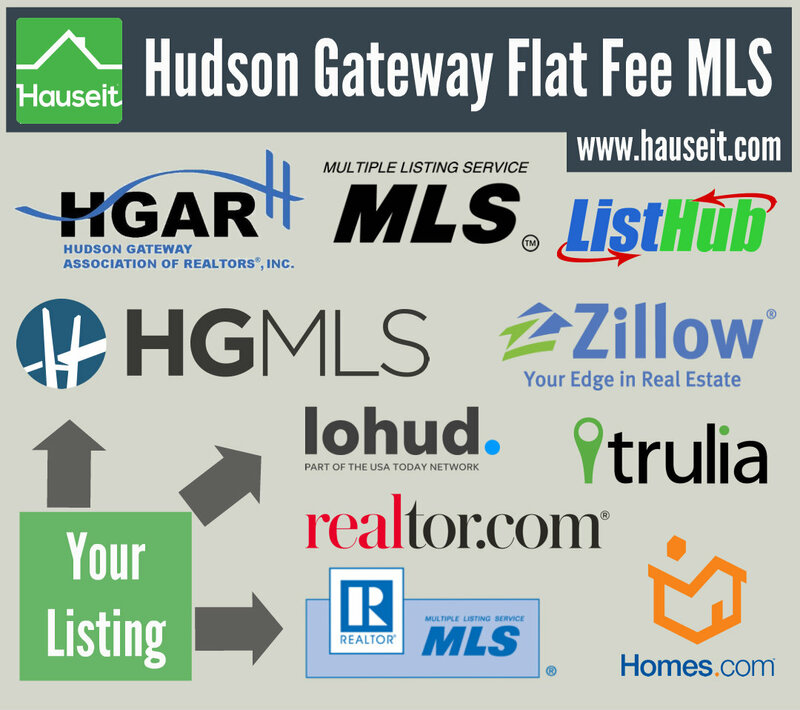 By signing up for a Hudson Gateway Flat Fee MLS Listing, your property will be advertised all at once to thousands of HGAR Member Agents as well as all unrepresented home buyers through dozens of popular real estate search websites. Access to HGMLS is member-only, and it’s the system that thousands of agents in Westchester, Bronx, Orange, Putnam, Queens, Dutchess, Ulster, Rockland and Sullivan Counties use to search for and send listing ideas to their buyer clients. According to the National Association of Realtors, an MLS is a “private offer of cooperation and compensation by listing brokers to other real estate brokers.” In short, the Multiple Listing Service (MLS) is a shared database of listings accessible only by fellow brokers who are members of the MLS. When a property is listed on MLS, it means that any fellow member of the MLS is contractually eligible to earn a commission if he or she finds a buyer for the property. This is a significant advantage over a traditional For Sale By Owner listing where the owner has no way to systematically guarantee an offer of commission to buyers’ agents. As a seller in Westchester, Bronx, Orange, Putnam, Queens, Dutchess, Ulster, Rockland or Sullivan Counties, the only way to have your property listed on the local MLS (HGMLS) is to hire a listing agent who is a member of the MLS system. Using a Hudson Gateway Flat Fee MLS Listing enables you to list your home on HGMLS (Hudson Gateway MLS) for a one-time, flat fee as opposed to hiring a traditional listing agent and paying 6% in commission. There are currently over 800 different MLS systems, so it’s critical that you choose the right MLS before listing your home. Fortunately, the choice for home sellers in the Hudson Valley is easy. HG MLS (Hudson Gateway Multiple Listing Service) offers comprehensive coverage throughout the Hudson Valley. Listing your property through a flat fee MLS listing ensures that you will receive the full attention of the roughly 75% of home buyers who are represented by agents. That’s because every New Yorker has at least five real estate agent friends, and what first time home buyer would turn down the offer of “free” professional assistance? As a result, many home buyers simply check out listings that their buyers’ agents carefully select and send to them. Your listing will not be selected and sent to represented buyers if it is not listed in the local MLS. And if that is the case then your property listing is effectively off market as you are missing out on the majority of home buyers! Even if a few buyers’ agents do see a traditional For Sale By Owner listing on a public search website like Zillow, their primary motivation will be to solicit these hapless traditional FSBO sellers into paying them 6% for access to the HGMLS. Those buyers’ agents who happen to notice your listing on a public search website who are legitimately searching for a similar property for their clients will simply ignore your listing. Why? Because there is no reliable way for them to be paid! After all, why would a buyer’s agent risk a potential 3% commission payday by sending their buyer to a FSBO listing when there are hundreds of traditional, MLS listed properties which offer a contractual payout? Even if the buyer’s Realtor decided to show a traditional FSBO listing, he or she would have to waste both parties’ time by signing a one-off FSBO commission agreement. This makes your listing noncompetitive relative to every single listing on HGMLS, which already have contractual commissions on offer to buyers’ agents. Note: You should only list your property on the HG MLS when you are ready and able to show the property. If your property is listed on the HGMLS but you don’t have a good reason for not being able to show it, buyers’ agents may complain to HGAR because they suspect that the listing broker is intentionally withholding access in order to find a direct buyer. Repeated denials of access without a good reason can result in complaints filed and fines levied which would be passed onto you. Legitimate reasons for why your home can’t be shown can be because of a sleeping infant, because the floors are being re-done, because the owner wants to be present for all showings, etc. The Hudson Gateway Association of Realtors, also known as HGAR, is the primary Realtor association in Westchester, Bronx, Orange, Putnam, Queens, Dutchess, Ulster, Rockland and Sullivan Counties. As of August 1, 2017, HGAR has just over 10,000 members associated with 1,370 HGMLS participants. This makes HGAR one of the largest, local Realtor associations in New York State. For context, the New York State Association of Realtors (NYSAR) boasts only 50,000 members total, including HGAR members. As of 2017, the National Association of Realtors (NAR) boasts 1,200,000 members nationwide. HGAR was founded in 1916 as the Westchester County Realty Board in White Plains. It merged with Pelham Realty Board in 1947. In 2009 it merged with the Putnam County Association of Realtors. In 2011 it merged with the Rockland County Board of Realtors and the Orange County Association of Realtors to the become the Hudson Gateway Association of Realtors. In 2016 it opened up a Manhattan Chapter through a merger with the Manhattan Association of Realtors. As of 2017, HGAR is headquartered in a sleek, surprisingly modern, rooftop office space at One Maple Avenue, White Plains , NY 10605. It has two other offices located at 2 Medical Park Drive , Suite 17, West Nyack , NY 10994 and 9 Coates Dr , Ste 1, Goshen , NY 10924. HUDSON GATEWAY MULTIPLE LISTING SERVICE, INC. (HGMLS) is a a wholly owned subsidiary of the HUDSON GATEWAY ASSOCIATION OF REALTORS, INC. The HGMLS is a computerized network of thousands of affiliated real estate offices located in Westchester, Bronx, Orange, Putnam, Queens, Dutchess, Ulster, Rockland and Sullivan Counties. The HGMLS is used by thousands of HGAR Member Realtors to search for and send suitable listings to home buyers. At any given time there are at least 5,000 listings and typically much more on the HGMLS. In fact, as of early October 2017 there were approximately 37,000 listings on the HGMLS. The system that HGAR Members use to access the HGMLS is called HGMLS Matrix, or simply “Matrix.” As of September 20, 2017 the latest version of Matrix is Matrix 7.0. Through Matrix, Realtors have the ability to search property tax records going back to 1997 via a service called Realist. Our Hudson Gateway Flat Fee MLS Listing Service is available across all of the Hudson Valley including Westchester, Bronx, Orange, Putnam, Queens, Dutchess, Ulster, Rockland or Sullivan Counties. Please let us know within 24 hours once you have accepted an offer, the buyer has signed the contract, you have counter-signed the contract and once you have closed. Please let us know as soon as possible by submitting an update here or looking for the Listing Update button under Tools in our website’s main menu bar. The HGMLS requires listing status changes to be completed within 24 hours, and they issue significant, automatic fines to any party who does not provide updates in a timely manner. To avoid these monetary penalties being passed onto you, we kindly ask that you keep us informed on the progress of your sale. Many owners find it more convenient to purchase their own lock boxes. There are many combination lock box models available and you can enter access information in the HGMLS for buyers’ brokers to see. Since a flat fee MLS listing is an owner managed service, you should do so only if you feel comfortable letting buyers and buyers’ brokers enter your home unsupervised. For context, HGAR listing agents typically use Supra lock boxes and the associated smartphone application to give fellow HGAR members access to their listings. HGAR listing brokers can give a one day code to out of area real estate brokers who are not HGAR members and who do not have the associated smartphone application. However, any HGAR buyers’ agent must have the smartphone application to be able to access HGMLS listings that are secured by Supra key boxes.